For me, shooting is such a mental activity. When I feel good about myself and life, I tend to shoot well. However, when I feel anxious or stressed, it negatively impacts my shooting. I sometimes refer to myself as “The Schizoprenic Wing Shooter” because, when it comes to my accuracy with a scattergun, I never know who is going to show up: Deadeye or Dudley. Some days it seems Dudley couldn’t hit the backside of an elephant, but then there are those days when Deadeye can do no wrong. When you are in a shooting slump, you sometimes wonder if you can ever redeem yourself. But, after fifteen years of bird hunting, I know that the pendulum always swings back and Deadeye will once again make good on the opportunities presented. I had to work the week following my weeklong hunt with Shawn, but when Saturday rolled around, I was anxious to once again chase some birds at my favorite covert, the Royal Macnab. Of all the places we hunted the previous week, the Royal Macnab was where we saw the most birds. So, I was excited to try this special covert with just me and my Brittanies. Also, I was hoping to overcome the shooting slump. When we hunted the Royal Macnab the week before, it was cloudy and the cover was soggy, which in turn, dampened the spirits. 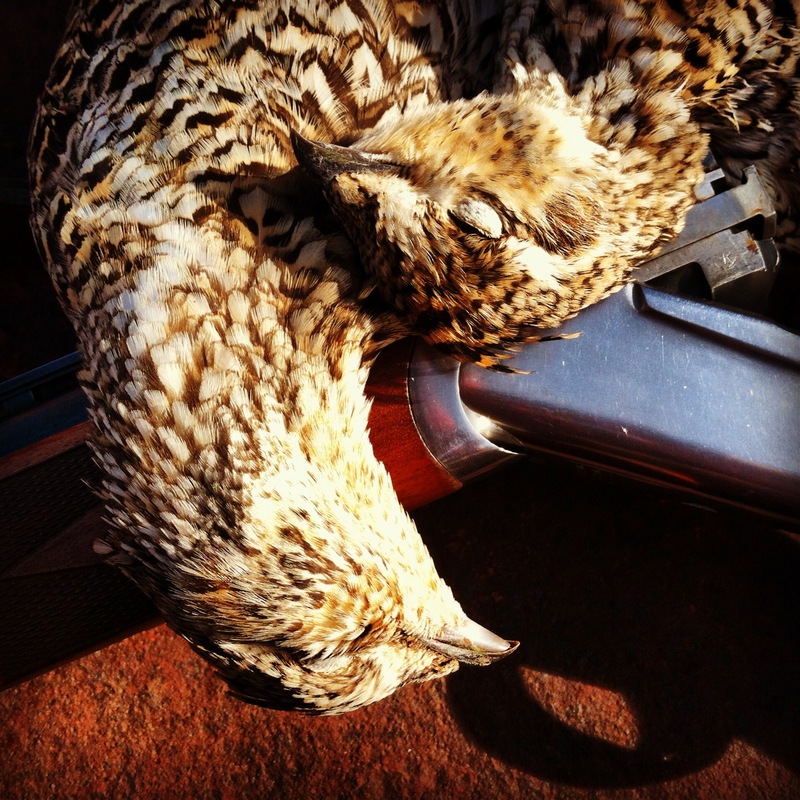 However, last Saturday was a blue bird, autumn day that all hunters live for. The weather and the scenery worked wonders on my attitude and confidence. And I quickly saw big flocks of sharptails on the move, which was a good omen. I had that unmistakable feeling that comes a few times each hunting season that it was going to be a banner day. 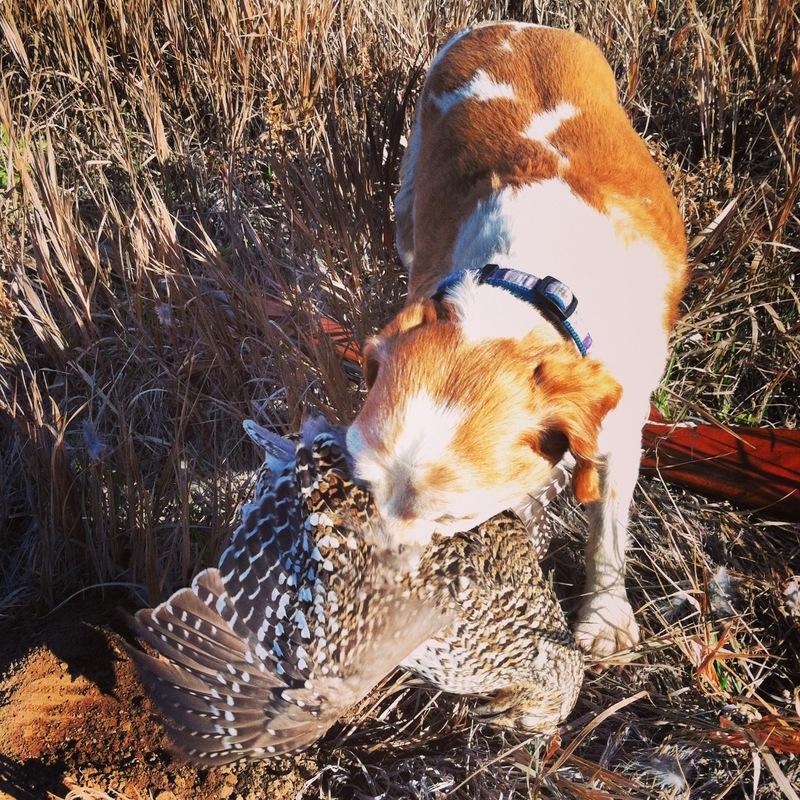 Sunny Girl points a ruffed grouse that I didn’t get a shot at because I was busy taking photos. 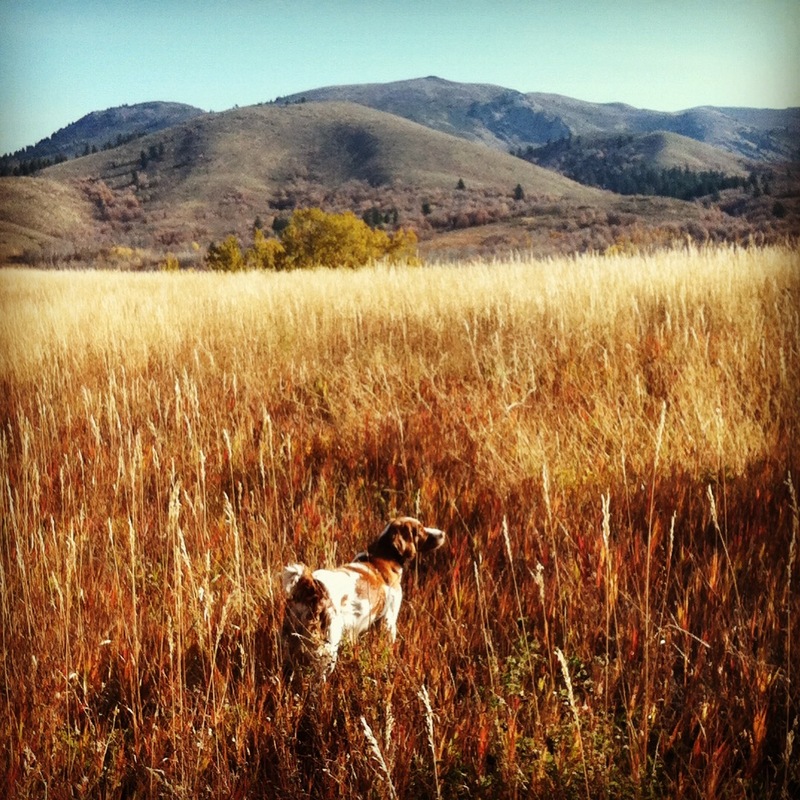 During our first hunt, we saw a covey of about twenty Huns, which Misty bumped out of range so I had no shot. We also found one ruffed grouse, which Sunny pointed and flushed over my head while I was taking her photo. We just couldn’t seem to get close enough to those flighty sharptails. So, as far as my shooting goes, I still wasn’t sure who had come to play: Deadeye or Dudley. For our final hunt, we hunted the Lower Stretch near the edge of the big draw and moved no birds and then swung around toward the rolling hill. We cut down through the grassy valley and headed to the top of the hill. When I reached the crest, I watched a solitary grouse get up a 100 yards ahead. So I decided to make my way up to where it had flushed. As I suspected, when we reached the area, another sharptail flushed back toward the big draw and I took a poke at it from about 40 yards. To my utter amazement, the bird careened down after my shot. As we hustled toward it, another sharpie got up with the exact same escape plan and I dropped it too. The shooting slump was finally over!!! A nice brace of sharptail from the Royal Macnab. The shooting slump is over! Misty and I worked over into the divot where both birds had fallen. Misty locked up on point and then went in and stood over the second dead bird. For some reason, Misty refuses to retrieve this year. Excitedly, I squatted to pick it up and the crotch of my pants split open. I grabbed the bird and told Misty, “Good girl, Misty!”. Misty pointing on the Royal Macnab. Sometimes it all comes together. 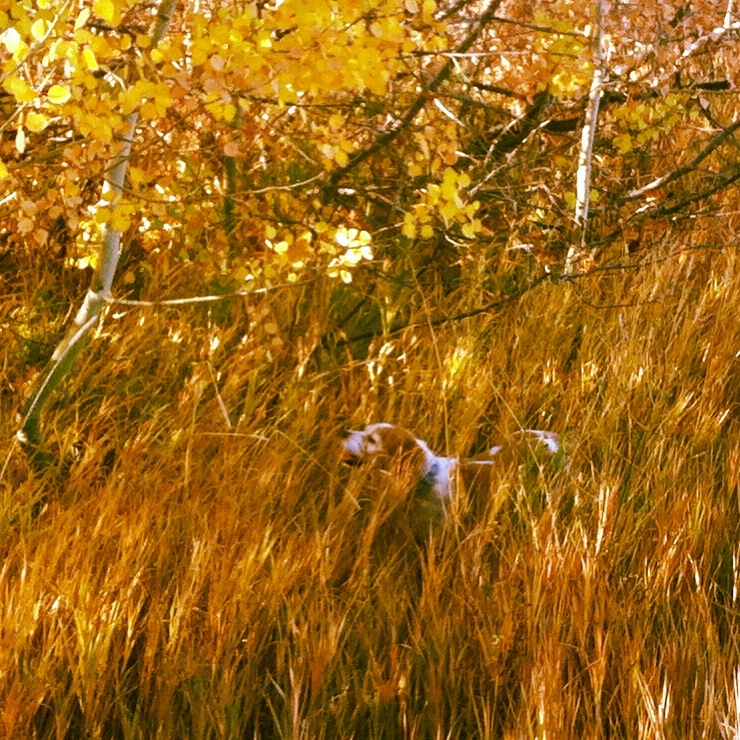 Sunny Girl makes a nice retrieve of a sharptail. Although it wasn’t the most graceful moment in hunting history due to a wardrobe malfunction, Deadeye went two for two on sharptails and one of them was the longest shot of the year. Misty poses with a limit of sharptail. 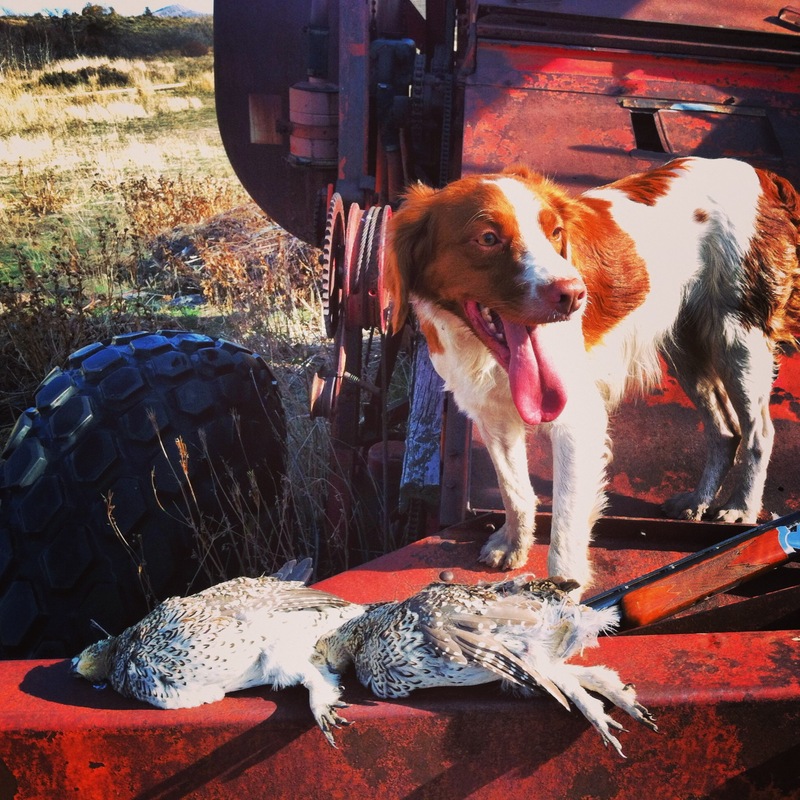 I appreciate every day afield with my bird dogs, but those days when ol’ Deadeye comes through are to be cherished. However, as every hunter knows, you have to take the good with the bad. The trick is to learn to love every day that you have outdoors, regardless of who shows up! couldn’t agree more with you. Sometimes the ones I make are the ones I expect to miss, and the ones I miss make me want to amputate my trigger finger as easy as they should have been. Still nobody shames me like the dog…his “You gotta be kidding me” look is really classic. I’m so glad I’m not the only one out there with this problem…haha! It sure makes bird hunting interesting.